The Peak Tram Service is suspended from 23 April 2019 for 2-3 months. Check out the alternative ways to reach the Peak, including the temporary bus route X15. Mongkok has a reputation as one of the most densely populated places on earth, and if when you visit you can well understand why this is. Packed full of high rise buildings with shops on the bottom few floors and many floors of flats above, it packs in what would in another country be a major sized town into a tiny vertical space. If you don't have to live there then that's great, because everything you need is in walking distance, and there is plenty to see. The same things that attract local Hong Kong residents to the district also appeal to the tourists and visitors. Shopping, more shopping, markets, entertainment, and more shopping are to be found on every street. Be it the world famous "Ladies' Market" on Tung Choi Street, or one of the lesser known attractions such the Bird Garden, there is something here for everybody. 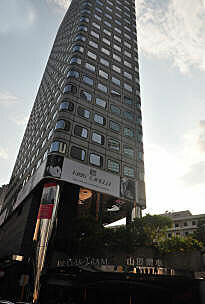 But while shopping in Mongkok is a great experience, it shows only one aspect of the city. To get an overview, and see some of the green countryside that is to be found even in the heart of Hong Kong, the visitor should go to The Peak as well. In fact spending some time in Mongkok, then going straight to the summit of Victoria Peak all in the same afternoon makes a great contrast and really shows how Hong Kong is such a diverse city. As Mongkok is in central Kowloon, and Victoria Peak is on Hong Kong Island, it is necessary to cross Victoria Harbour to go from one to the other. Whether you want to go as fast as possible, or take a more leisurely scenic route, the distance is not great and it won't take much more than an hour, and can be done in half of that. What is not a good idea is to walk, even including the ferry, this would take more than two hours and is not particularly worthwhile unless you are walking for the sake of it. Hong Kong's modern and clean underground railway system, the MTR, when combined with the ubiquitous red taxis, makes for a fast, safe and reliable trip. It is a good option if you are pressed for time. Anywhere in Mongkok you will see the street signs for the MTR, follow those to your closest entrance. Enter the Mongkok MTR station and head for the Tsuen Wan, or red, line towards Central. Get off at Central, after 4 stops, the red station. Walk along the road a few steps and it should be easy to flag down a red taxi. Although this is not an official taxi rank there are so many taxis dropping off passengers here it is a good place to catch one. 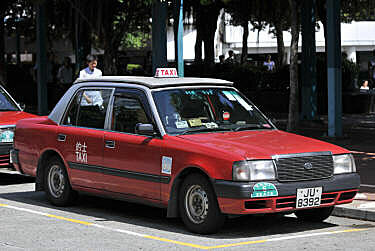 Ask the driver for Victoria Peak, every taxi driver in Hong Kong is familiar with this in English. If you just ask for Victoria Peak the driver will drop you outside the Peak Tower, which is the upper Peak Tram terminus. This is a good place for taking the circular walk, and for visiting the shopping arcades. However, if you really want the highest view point then instead ask for the driver for Victoria Peak Garden, which is the highest viewpoint and otherwise a 20 minute uphill walk from the Peak Tower. This option is more of the sightseeing choice, where you get to see things as you go along. As they say, getting there is part of the experience and it certainly will be if you choose this option. Public busses in Hong Kong are for the most part clean, modern, safe and not crowded except at rush hour. The Star Ferry across Victoria Harbour is one of the main attractions of Hong Kong, second only to The Peak, and taking the Peak Tram is of course an integral part of visiting Victoria Peak for many people. 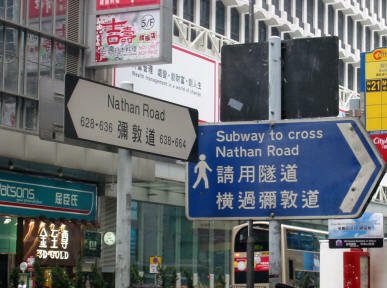 Walk to Nathan Road, signs pointing to the MTR will take you there, make sure you are on the eastern side of the road. Take any southbound bus going to Star Ferry, such as the 1, 1A or 2. At the Star Ferry Central pier, which is pier 8, turn right and walk along until you are outside Pier 5. Cross to the central traffic island and find the bus 15C. Take care that you are on the "C" bus and not the "15". This route is only recommended if you can do it early in the morning, as the Peak Tram becomes busy by mid morning and there may be long queues for much of the day. Skip the ferry, and don't like the tram? It is possible to do the entire trip by bus, though you do have to chance once. If you are suffer from seasickness and the Star Ferry sounds like a bad idea to you, or the steep funicular that is the Peak Tram is not too your liking, then a bus only trip is certainly and economical and practical way. Ride the bus through Happy Valley, and up the eastern side of the Victoria Peak all the way to the Peak stop, which is under the Galleria Shopping arcade. While often visited for the view the visitor should not forget that The Peak encompasses a wide range of dining options, from the casual to the sophisticated. Within The Peak area are examples of many of Hong Kong's most authentic and distinctive styles, as well as international choices to fit all palates and budgets. © Copyright 2004-2016, WL Media HK, All Rights Reserved.